We’ve learned the basics of bones, bone hierarchy, and actions. There are still a few things for us to learn but it’s time to put what we’ve learned so far to the test. 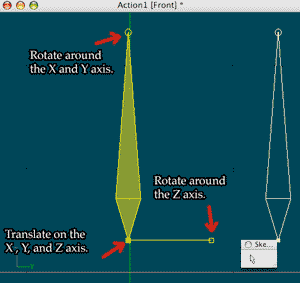 We’re going to use an Action window to manipulate some bones and check our hierarchy then we’ll compare that to manipulation in a Model window. This will help make clear why each environment has its own place in the rigging process. How to manipulate a bone in an Action Window. 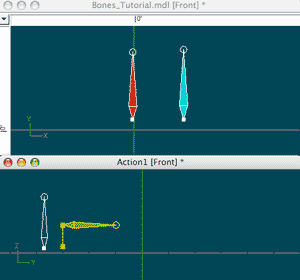 The way to move bone in an Action window is a bit different than in a Model window. Remember that the Model window is for creating and laying out the bones so manipulating them there is geared differently than in an Action window. In an Action window (Choreography and Pose windows as well), bones are rotated by grabbing the tip of the bone and moving that around the base of the bone. Moving the entire bone is done by grabbing and dragging the base of the bone to where you want it to go. 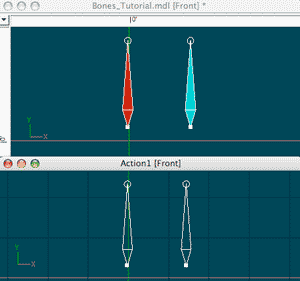 How to manipulate a bone in a Model Window. In contrast, bone manipulation in a modeling window is a bit more fluid and better suited for quick and easy placement of bones. 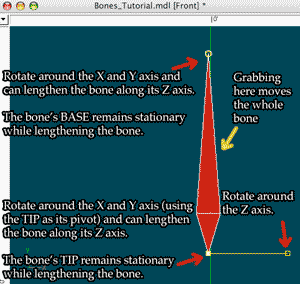 In a Model window in Bones Mode, a bone can be rotated (pivoted) by grabbing either the tip or the base of the bone and dragging it around. 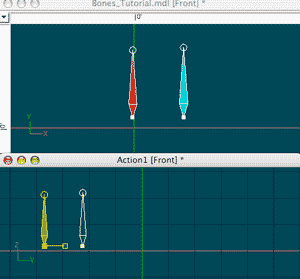 You’ll also notice in Bones Mode that you can also change the length of the bone on the fly by moving the dragging the end that you have grabbed away from or towards the other end of the bone. In order to actually move (translate) the entire bone you have to drag the bone from between its ends at its approximate midpoint. Back to our “Bones_Tutorial” model. All right. Let’s start to tie some of the information that we’ve learned together. We are going to work inside of the Action window to experiment with the bone hierarchy that we just learned about. After that we are going compare the differences between how a bone behaves in the Action window and a Model window. We are going to work with both of these windows open at the same time. 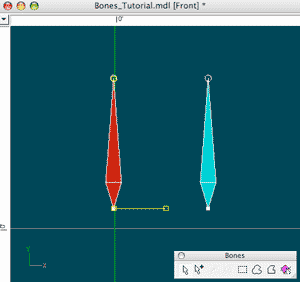 We’re going to start by opening our “Bones_Tutorial” model again. The Model and Action windows have been tiled horizontally. After we open that model we are going to create a new Action using the same “Bones_Tutorial” model as the model for the Action. To make what we are doing a little easier to keep track of between the two windows, we are going to have them share the screen at the same time. Go ahead and arrange the Model window and Action window on the screen so that you are comfortable with it. “Bone1” has been moved to the left and “Bone2” followed in relation to it because it is a child of “Bone1”. Ok, now that we are situated we are going to compare how the bones behave differently in each window. We are going to start with the Action window first because I also want to show you the Bone Hierarchy that we laid out live and in action . Go ahead and select “Bone1” in the Action window. Since the bones are not colored in the Action window you can see for sure which bone that you have selected by checking the PWS or the “Properties” window. Either of those windows will show you the highlighted name of the bone. Once you have “Bone1” selected, go ahead and move it around the window or rotate it. If you have followed along with me prior to this and have “Bone2” as a Child of “Bone1” then you will see that “Bone2” also moved in relation to its original position with “Bone1”. “Bone2” has been translated and rotated. It has no effect on “Bone1” at all. Now select and move “Bone2” around any way that you want in the Action window. Since “Bone2″ is a child of ‘Bone1” we will see that its movement has no effect at all on “Bone1”. What we have just seen is a simple bone hierarchy in action! Prior to this section we have only seen the structure of it in the PWS. Hopefully now that you can actually see it working you’ll understand it a lot more than just looking at the structure in the PWS. Notice how none of the bones in the Model window moved when we moved the bones in the Action window. Now choose any bone in the Model window and move it any way that you want to. 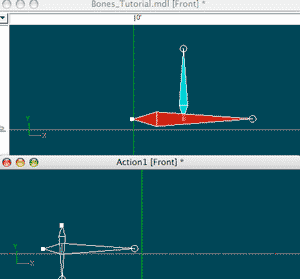 Not only will the bone move in the Model window but the corresponding bone will move in the Action window. This is happening because the Action is referring to the actual model as we have set it up in the model file. When we moved the bones in the Model window, the Action that we were also working in compensated for the baseline change in the Model itself. So if you had done nothing at all in you new Action window and moved the bones in your Model window, the Action window would appear to mirror whatever changes that you made in the Model window. Don’t mistake this as indirectly editing an Action via a Model window. If we made a few changes in the Action window first and then moved a bone in the Model window, we would see the change but the change would not appear to mirror our Model window exactly. Instead, we would really being seeing the values of the transformations that we made previously in the Action window applied to the model’s new default state. So we would see changes but not what we may have initially expected. This what we saw occur in the example above. Go ahead now and experiment with this some more to see what we are talking about. 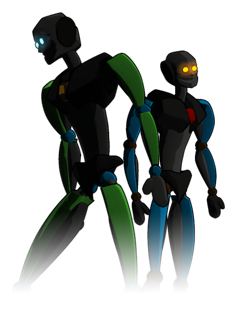 This concept may seem a bit abstract here but we’ll see how doing this will become useful later when we rig a character. Having a Model window and a corresponding Action window open simultaneously is a good thing to do when you are setting up your model’s rig. Part of the the reason for that is because we can use this method to tweak our bone placement within our model’s mesh (In the Model window) to determine the optimal location for a particular bone. We can then see the result in the Action window when we move the bones around to see the effects. We can keep readjusting until we are satisfied with the results.